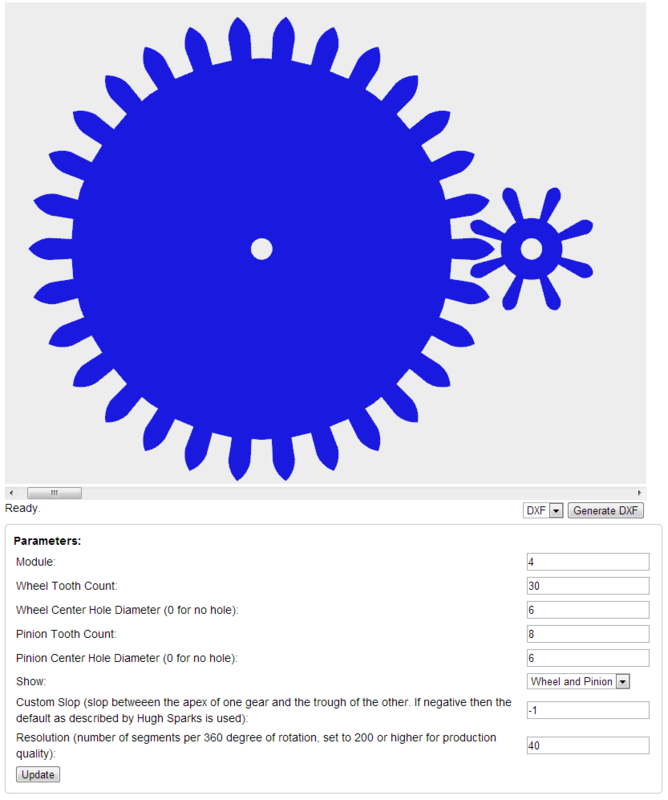 First off, “Thank You!” for the cycloidal gear designer. I have been searching for something like this to assist me with a clock I would like to design. I have not been able to get the DXF generated file to open within cad or a DXF viewer. I have been able to use your stand alone version, but not the on-line version. I have since found that the DXF file will import into SketchUp. Thank you for the kind words. I must admit that I haven’t made much progress on the wooden clock building front. I cut the first gear with my CNC router using a dremel as the spindle and realized that it is not accurate enough. I have a new spindle but still need to mount it, complete the speed controller that I prototyped, etc. Slowly but surely I will get there, though. I just discovered your web site and I am blown away by your designs! Obviously my aspirations are much more modest but I would be very interested in learning from your experience. I was delighted to find your ‘online cycloidal gear builder’ … but quickly disheartened when I discovered that it relies upon WebGL; which is widely identified as a serious security risk. Is there any way in which this very useful-looking application can be run OFF-line, in a safe environment? Note: I prefer to use my [Snow Leopard] Macs, but I also have access to Windows7 and XP machines. Please to not take this as any criticism of your work … I just feel uncomfortable about WebGL. I have designed and prototyped a cyclo-type of gearbox. Which works well but is a bit noisy. I would appreciate some design advise – as it need it to work silently. Dear Rainer, I may be on the completely false track here since I am not an engineer: I have generated a cycloidal wheel and pinion on your generator with the following parameter. Wheelteeth: 40 Pinionteeth: 10, Module: 0.44 This should result in pitch diameters 0.44 x 10 = 4.4mm and 0.44 x 40 = 17.6mm. The .dxf generates alright. However if I import this in Dassault’s DraftSight CAD I measure an overall OUTSIDE circle diameter of 17.24mm for the wheel and 4.4mm for the pinion. M=(2×11) / (10+40)=0.44 – am I mistaken somewhere? Thanks and all the best, Alex Törzs.